• St John Ambulance has launched a Children’s First Aid Kit for the treatment of cuts, grazes, bleeding, bumps and bruises. 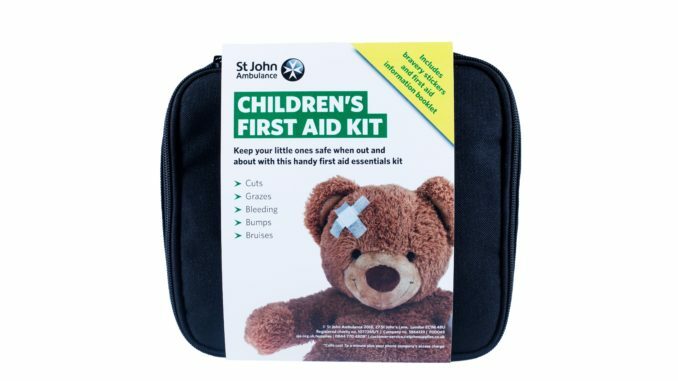 St John Ambulance has launched a first aid kit for treating children – complete with teddy bear and giraffe reward stickers. The nation’s leading first aid charity has launched the Children’s First Aid Kit in time for the summer holidays, when a high proportion of accidents among children are known to take place. The pack contains first aid items for treating minor injuries such as cuts, bruises, grazes, bleeding, bumps and catching something in the eye, as well as a first aid information booklet and six “bravery” stickers to put a smile back on little faces. “While we know parents do their best to prevent mishaps, they don’t want to wrap their children in cotton wool either and especially encourage them to spend time outdoors during the longer days of the summer break. Parents wanting to learn or refresh first aid skills should visit sja.org.uk. The Children’s First Aid Kit is on sale now and can be purchased with free delivery from the St John Ambulance customer service team on 0844 7704808 using the quote CFA111205. It will also be available from Amazon soon.